Web Tools and Tips | Web tools and tips. Make the best of the tools the web has to offer. Web tools and tips. Make the best of the tools the web has to offer. “Well it was bound to happen sometime”, said Microsofts founder Bill Gates. Okay maybe he didn’t say that, but I bet he used stronger language! So Google’s attempt to take over the entire world continues with it’s recent launch of the Google Chromebooks. Basically e-machines that come with their browser Google Chrome installed. While Microsoft are probably not losing too much sleep about this just yet, they must see the writing on the wall as Google makes more in-roads into Microsofts traditional market space. The fact that it’s a Google Chrome pc suggests to me there won’t be room for another browser on their machine. Students can rent a Google pc for $20 per month on a two year contract, while prices for buyers starts at around $400. So it’s a new dawn for home computing but the world keeps turning anyway. Just installed Jing from TechSmith (the makers of Camtasia, SnagIt and more). Jing is a free basic screencapture and screencast application that sits descreetly on your desktop for when you need to access it. you simply click and drag a cursor over the area of the screen you want to capture and start recording. Your screencast can be shared online (you get free web storage space with your software) or you can save the file to your pc. This is a really easy application to use and at that price you can’t complain! There is also a pro version with more features. If you’re looking for a less expensive version of Camtasia, this might be the solution. Check out Jing for yourself at http://www.techsmith.com/jing/, it takes only moments to download and install. Buying A Website – Big Spender Or Bootstrapper? When it comes to buying a website what is your attitude to budget? There can be two extreme spending approaches to buying websites, they are the ‘big spenders’ and the ‘bootstrapper’. Let’s have a look at the ‘big spenders first’. There are two type of people who fit this profiles. The first group are the people who believe that if the website does not cost them a lot of money, there must be something wrong with it, or it’s just not good enough. The more they spend the happier they are, in a way. They will probably have a niggling feeling in the back of their minds that maybe a lower cost site would have been just as good, though they will never admit this to others or even themselves. These people have to spend money, and good news for them, there are plenty of web studios out there only too happy to oblige them fulfil their spending desires. The second group of ‘big spenders’ are people who work for a fair sized company. They are given a generous budget to spend and if it’s not all spent, there next budget is likely to be cut. So, spend they must, and spend they do. I dare say these are a rarer breed in light of the current economic client, but there’s still bound to be some around. The problem with ‘big spenders’ is they often pay way above the odds for their website. With advancements in web authoring technology, even budget websites can pack a serious punch and deliver as many options and features as their more expensive counterparts. Bootstrappers are the other side of they coin. They often think a business website will cost a fortune and their small start-up business cannot afford to take the hit to capital. So instead of getting a good low cost site they either keep putting off getting a site or just use Facebook or similar social media pages. The truth is that for a few hundred down, they could have a powerful content management site with all the update tools and features they could dream of. Contacting a web designer that provides excellent value and excellent web design packages could be the first step to really taking advantage of the Internet for business purposes. Bootstrappers need to keep tight reins of their marketing budget, so a good web designer will provide a fixed quote for them with a clear outline of what is included in the job. So whether you are a ‘Big Spender’ or a ‘Spendthrift’, you’ll most likely find that a good budget website design will fulfil your budget requirements and your online business needs. Check out the web design Ireland blog and website about more advice on setting up a website. For tutorials, videos and articles about creating and editing websites, anti-virus advice and SEO tips check out Free Web Template Stock. More Irish business owners understand the importance of getting their businesses online, but many are unsure at how much it costs to have a website designed and the annual costs involved? It really can be difficult to gauge just how much you should spend and quotes from companies can vary wildly. So, let’s take look at the basic costs of starting your very own website and what’s involved. How much you spend is largely up to you. You could easily spend thousands of euro on ‘bells and whistles’ that you really don’t need. To ensure you’re not paying too much for your website try to first educate yourself about what you really need from your website provider. The following guide will help. To get started, every website needs a domain name and a web host. A domain name (also known as ‘URL’ or ‘website address’) is simply the name you want to give your website. For example, MSN’s domain is msn.com. To get a domain name of your own you have to pay an annual fee to a registrar. This gives you the right to use that name for your website. Prices vary from one registrar to another and for different types of domain (.com, .eu, .co.uk, .ie etc.) but you can usually expect to pay between Euro10 and Euro30 for a domain. Now that you have your domain you need to host your website and point your domain toward it. Hosting servers are connected to the Internet making your website available for the world to see. Think of your web host as your landlord, but instead of renting an apartment you’re renting space on their server. This hosting space is where your website is housed and your domain is a signpost to direct people to your site. As far as actually building your site and adding content, there are plenty of options, from free website builders (provided with some hosting services) to building a site from scratch yourself to using the services of a professional web designer. Professional websites can be expensive; however there are companies in Ireland that provide excellent services a low cost, tailored in particular for small businesses. Starter Websites a Kerry Web Design service and a leading low-cost website provider in Ireland. Each website has custom design features, is built to recognised industry standards and rigorously tested in multiple browsers to ensure it displays correctly. All Starter Websites come as a complete web package that includes a free .com domain for 12 months, free hosting for 6 months as well as other bonuses (such as SEO) and regular special offers. It’s always a good idea to shop around before making your choice of web designer and finding a designer you are happy to work with is equally important. Getting your business online is made easy by website design providers like Starter Websites. All you need to do is provide text about your business, detail your services and provide contact information and the name you would like for your website. Starter Websites will typically have your new website live within 5 to 10 working days, usually for as little as Euro395. The cost of getting a professional website need not break your promotion budget, and your website will add value to your business, enabling prospects to visit your site and learn about your services 365 days a year. So don’t put if off any longer, get you business online starting today. OKay, gotta’ tell you about this handy little plug-in for WordPress. Excellent for those customizing WordPress sites. Let’s say you want to add a new page but DON’T want it to show up in your navigation list. You can download this WordPress plug-in, upload it, activate it and then exclude pages just by unchecking a check box in the page edit section for any page. It’s real easy to use and takes seconds to set-up. 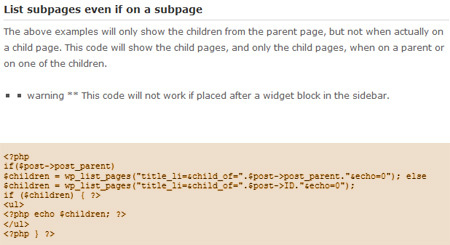 Get it here: Exclude Pages In WordPress. Okay, this is as much for my future reference as it is for you right now. I’ve been looking for this solution to listing sub-pages navigation on both the parent and all the child pages. Anyway, don’t know how I missed it but it was right there at the bottom of ‘Template Tags/wp list pages’ all along (I assume). Here’s the extract from that page. Enjoy and good luck with your WordPress customization!